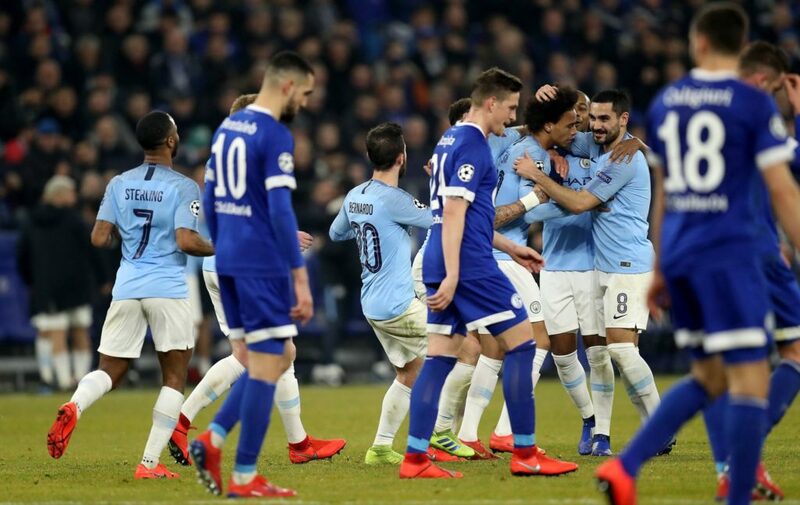 Leroy Sane and Raheem Sterling scored late goals as 10-man Manchester City stunned Schalke at Veltins Arena to claim a 3-2 first-leg win in their Champions League last 16 tie. Despite leading through Sergio Aguero’s 18th-minute effort, City were behind at the break after Nabil Bentaleb scored a pair of spot-kicks. The first of those, awarded after a lengthy period of deliberation and confusion, was given for a handball against Nicolas Otamendi, who was booked for that transgression and then picked up a second yellow card with 22 minutes remaining. Pep Guardiola appeared content to settle for just a one-goal deficit at that point, yet substitute Sane had other ideas, brilliantly firing in an 85th-minute free kick to equalise against his former club, and Sterling then latched on to Ederson’s long clearance to score a 90th-minute winner on a wild night in Gelsenkirchen.